After Shams Charania of The Athletic reported on Wednesday that Dillon Brooks would likely miss the remainder of the 2018/19 season due to a toe injury, head coach J.B. Bickerstaff was put on the spot during his usual media availability. As David Cobb of The Memphis Commercial Appeal details, Bickerstaff was frustrated by the fact that he was asked about the report on Brooks before the team was able to put out an official update. While the news on Brooks’ injury would have been announced a few hours later anyway, there have been a number of other instances within the last month where leaks impacted the Grizzlies more significantly. The most obvious cases involved the failed three-team trade with the Suns and Wizards, as well as a locker room altercation between Garrett Temple and Omri Casspi. After word of that Temple/Casspi incident broke, GM Chris Wallace said his team would deal internally with the leak. In another recent article for The Commercial Appeal, Cobb explored whether rookie Jevon Carter will take over for Shelvin Mack as the Grizzlies’ regular backup point guard. Carter appeared poised to claim that role, but struggled on Monday in New Orleans, prompting the club to turn back to Mack on Wednesday vs. San Antonio. Chris Herrington of The Daily Memphian took a deep dive into the Chandler Parsons situation in Memphis, exploring whether the Grizzlies should have known better than to give Parsons a big contract in 2016, whether the team has handled recent developments correctly, and what’s next for the forward. Heading into the 2018/19 season, Carmelo Anthony – who has resisted accepting a bench role in the past – told ESPN’s Rachel Nichols that he’s ready to make that adjustment for his new team. 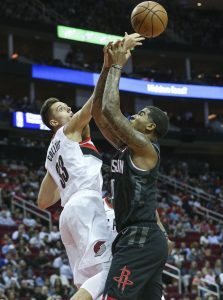 However, in his first game in a reserve role for the Rockets, Anthony scored just nine points in 27 minutes on 3-of-10 shooting. After the loss, the veteran forward admitted that there would be a “learning curve” for his new role, as Tim MacMahon of ESPN.com relays. The Rockets have promoted front office executive Monte McNair, changing his title from vice president of basketball operations to assistant GM, the team announced in a press release. The Mavericks signed and waived camp invitee Ding Yanyuhang twice before the regular season began. As ESPN’s Bobby Marks confirms to Hoops Rumors, Ding’s first Exhibit 10 contract with Dallas only included a $5K bonus, whereas the second deal bumped that bonus to the maximum allowable $50K. Ding will earn that money if he spends at least two months with the Texas Legends, the Mavs’ G League affiliate. When DeMarcus Cousins went down with his Achilles tear last season, it was something of a turning point for Anthony Davis, who recognized that he had to take his game to another level and carry the Pelicans. Brian Windhorst of ESPN.com has the story, along with the quotes from Davis and head coach Alvin Gentry. 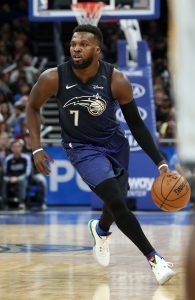 The Grizzlies‘ signing of Shelvin Mack was something of an afterthought in an offseason that also included the acquisitions of Jaren Jackson Jr., Kyle Anderson, and Garrett Temple, However, Mack opens the season as Mike Conley‘s primary backup at point guard, as Jason Munz of The Memphis Commercial Appeal details. Earlier this week, the Memphis Business Council hosted an event known as the “The Game Plan of Memphis Basketball.” A special guest of the event was Grizzlies head coach J.B. Bickerstaff. And as Mark Giannotto of The Commercial Appeal relays, there were plenty of questions to be answered by the Grizzlies’ head man, as noted below. What is the team’s strength this season? What were the highlights of the team’s offseason? What is Kyle Anderson‘s role? What are your hopes for Chandler Parsons? Why will the bench be better this season? 3:38pm: The Grizzlies have officially signed Mack, the team announced today in a press release. 1:58pm: The Grizzlies will sign free agent point guard Shelvin Mack to a one-year contract, league sources tell Adrian Wojnarowski of ESPN.com (Twitter link). Wojnarowski first reported about two and a half weeks ago that the two sides were discussing a one-year deal. 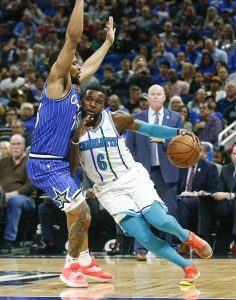 Mack, who inked a two-year contract with Orlando in 2017, appeared in 69 games for the Magic last season, averaging 6.9 PPG, 3.9 APG, and 2.4 RPG in a backup point guard role. His salary for 2018/19 only included a small partial guarantee though, so the Magic waived him last month before they were on the hook for the full amount. By signing Mack, the Grizzlies will add some veteran stability to their point guard depth chart behind Mike Conley, who is coming off a major foot injury. Andrew Harrison and Jevon Carter are Memphis’ other point guards, with Kobi Simmons also in the mix on a two-way deal. Memphis doesn’t have its bi-annual exception available this season and already used its full mid-level exception on Kyle Anderson, so Mack will receive a minimum-salary deal, which will keep the Grizzlies’ team salary just below the tax line. Assuming Mack’s contract is guaranteed, it’ll be the 15th guaranteed deal on the team’s books, plus Harrison’s non-guaranteed salary. The Grizzlies will have to trade or release at least one player before the regular season begins, with Harrison and Dakari Johnson among those most at risk.